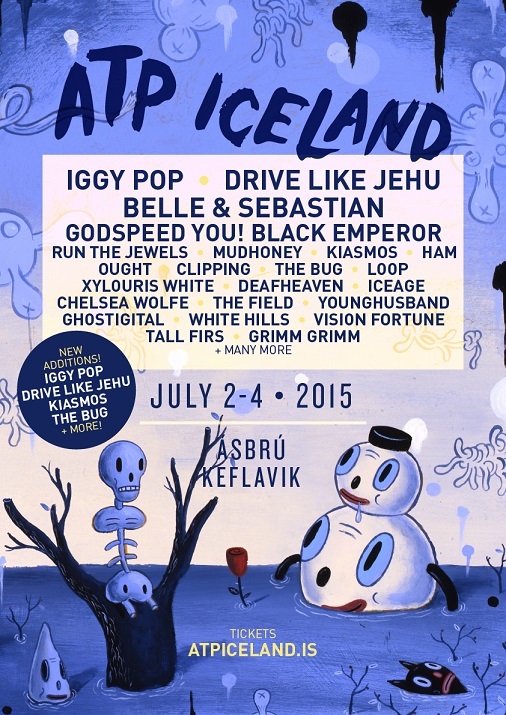 IGGY POP, DRIVE LIKE JEHU, MUDHONEY, THE BUG, OUGHT, DEAFHEAVEN, ICEAGE, AND MORE ADDED TO ATP ICELAND 2015. All Tomorrow's Parties are thrilled to announce the new line-up additions for the third edition of ATP Iceland festival in 2015, held at the former US Air Force base Ásbrú in Keflavík near the nation's capital. Joining confirmed acts like Run The Jewels, Deafheaven, Vision Fortune, headliners Belle & Sebastian as well as Godspeed You! Black Emperor, who play Iceland for the first time since 2002, are Iggy Pop, Drive Like Jehu, The Bug, Ought and Clipping. The inimitable Iggy Pop will play his first solo shows in a decade, performing classic hits from Lust for Life and The Idiot. Drive Like Jehu, who last year played their first show in almost 20 years, can claim to be one of the most seminal and influential artists of recent time and of course famously feature members of Rocket From The Crypt, Hot Snakes and Obits. Their ATP Iceland 2015 appearance will be the only place you can see them live at a European festival this summer. Elsewhere, Ólafur Arnalds’ much lauded home grown techno project Kiasmos will grace the main stage. ATP Iceland will be held at Ásbrú, the former NATO base in Keflavík, Iceland. The former NATO base dates back to 1941 and the last US military personnel left in 2006. The site is located only 5 minutes away from Iceland's main international airport, 15 minutes from the famous Blue Lagoon and 30 minutes from Reykjavík. The festival site will host two indoor stages and a cinema with films picked by ATP and the bands, as well as the usual ATP extracurricular activities like DJs, Pop Quiz and much more. Details of the curator(s) of the ever-popular cinema schedule will be announced soon, as well as info of the food & drink element of the festival that brings so much happiness to attendees each year, as they devour some Icelandic food between bands.